The first thing I do is come up with an idea, which then becomes a sketch. Once I'm happy with it, I outline the main lines with a sharpie. As you can see, I draw a grid over top of my sketch. 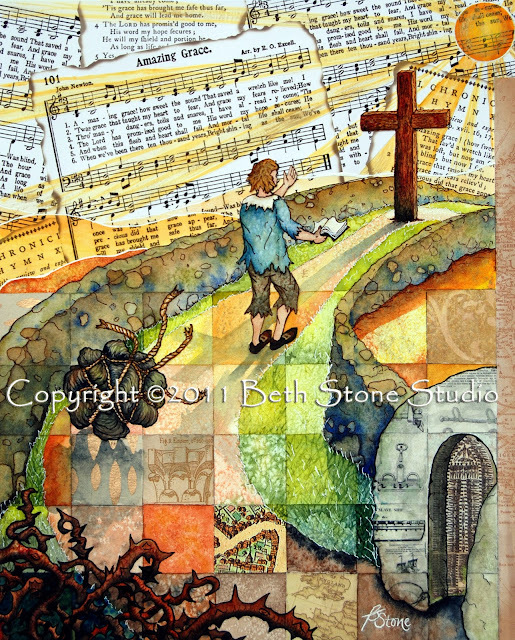 This is to carry on the "quilt" theme that I've been using on all of my other hymn collages. The Sharpie lines make it easier for me to transfer the sketch onto my watercolor paper. I use Arches 140lb CP paper... I usually just hold mine against a window to transfer it (lightly, with a pencil), but you could use a light box if you have one. So, back to the watercolor paper.... Once I've cut out my ephemera, I glue it into place with this fantastic product called "Yes! Paste." Good stuff.... it doesn't cause the paper to bubble up like some adhesives do. Sometimes I'll paint a bit on top of the ephemera if I need to... For instance, I painted shadows over the "tomb" section above in order to create the illusion of the door opening. I also added some mottled shading and mossy looking splotches in order to make it look like mossy stone. Once I get the squares filled in, I start working on the details. If you're wondering how to achieve that speckled look that you see in the green grass and the golden colored patches in the road and on and outside the wall, you sprinkle table salt onto the paint just before the shiny-wetness disappears. As it finishes drying, the salt crystals soak up some of the pigment and leave the mottled starry pattern behind. Once the paper has completely dried, you can gently scrape the dried salt crystals off with a stiff piece of plastic - an old credit card works perfectly. I continued filling in the details - painting in the clothing, the ropes on the burden, etc. My final step in the painting part was simply going back into certain areas and defining them more - creating "stones" within the wall, shadows here and there, beefing up the color and vibrancy in some areas, etc. After that dried, I decided that I didn't like the sun just sitting up there like an orange in the sky, so I decided to go back in with my watercolors and add some sun rays.... I then took some acrylic gold paint and dry brushed lightly over the sun rays, the sun, the cross, and some "highlight" areas on the road and his hair to give it a little sparkle. I also gave him some gold belt buckles with the acrylic ink. So, there you have it.... I hope you enjoyed the little journey. If you have any questions, feel free to ask, and I'll do my best to answer them! As I said yesterday, I will be introducing prints and jewelry featuring this piece at the art show I'm doing next weekend (E-mail me for more info on the show). After that, I will have them available in my Etsy shop! So be sure to either come by the show or check back the following week for the shop update. Thanks for stopping by! i enjoyed seeing your process, i love the detail that you have captured in your work..what type of watercolor paint do you use..
That is amazingly beautiful and moved me to tears! Wow, you really have an amazing talent and I pray that God blesses the work of your hands and blesses others with it. Thank you so much for sharing today. I know I'd never make something like that, but just seeing the art was amazing. I am feel so small next to you. Your art is so moving. perhaps I am too afraid....or perhaps I am in a different season? but yours is truly beautiful. I will think about it all day. This is amazing! I love seeing the step by step process. Visiting from JRU. Im so glad to see another watercolorist! This is the most incredible idea. I love Daniel Smith paints too but havent been painting long enough to afford many. We dont have much locally but I have found a hardware store that carries Holbein - I love to stop in and purchase a new tube when I am on that side of town 30+/- mi away. This song is so meaningful to so many people. I know it will be a blessing. I can not get over how amazing this is. WOW! Seriously wow. I love it so much. Gorgeous art for certain. Thank you all so much for the kind comments - you made my day! :o) I'm glad you liked the collage! Appreciate you for sharing the step-by step procedure... I always wondered how they made these?! Really cool, love it! This looks like a lot of work - and it is so amazingly beautiful. I enjoyed watching the process, thank you for showing us! This was interesting! Love this piece! Especially love your detailed description of your process! Thanks so much for sharing. This is amazing Beth! I am so happy to see your process... love to see how these works of art come to be. I too have those 'bomb went off' parts of the process. lol I wonder if that table salt technique would work on paint other than watercolor? Might have to give it a try! I love the look. I hope you have a great time at the art show... I would love to hear all about it! 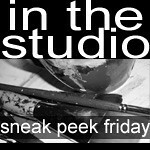 :) Thanks for joining us 'in the studio' this week Beth! wow, this is absolutely stunning!!!. ...and I love the way you created it. Thank you for sharing!!! What a lovely collage, and great step by step process! Jennifer - I don't know if the salt would work with other mediums... Let me know if you try it! What a beautiful piece of work Beth! Definitely enjoyed the journey through your WIP too! Thanks so much for visiting and taking part in my blog giveaway! Beth, these are beautiful! Your style is similar to my own. And I usually think mine are eh... but seeing your art just helped me see my own with new eyes. Love it all. Thanks so much for sharing! This is fantastically beautiful! I enjoyed seeing every step! Thank you!